The Lotto Master Formula by Garry G gives you a lotto formula for winning the lottery much easier than just playing the lotto blind. Lotto Master Formula is developed and produced by Garry G, a self proclaimed lottery expert. He says he used to be suffering from losses from successive 10 years of playing lotto, then finally found a secret key to success after analyzing each and every failure. What happened for him next was he claims he won lottery after lottery winning altogether millions of dollars. To sweeten the deal, the Lotto Master Formula is lottery legal and easy to understand as it has no real mathematical formula and claims will work for all lottery games. Now let me tell you the real honest truth about the Lotto Master Formula. Garry G who says he won millions with his lotto formula and claims it will work for any major lottery game in the world such as California Lottery, Florida Lotto, New York Lottery, Washington Lottery, Georgia Lottery, Lotto Max, Lotto 649, Ohio Lottery, Idaho Lottery, Indiana Lottery, Powerball lottery, Mega Millions and so on is lying to YOU! The sales page says the lotto formula system gives you a 78.9% accuracy for winning smaller lottery winnings and a 66.2% accuracy for winning the jackpot and will only cost you an insane $97 to find out that the Formula 1 Lotto System is a Fraud! The sales website shows you a bunch of lottery winners holding up their winning lottery cheques, but the names are blanked out why? If they are real winners there is no need to blank them out as they are posted on the official lottery websites for all to see. None of the lottery winners used the Lotto Master Formula system, the seller is just making it look like they did, all fake. Garry G did not win millions, as Garry G is really just a shady marketer using the name. The Lotto Master Formula website has many testimonial and again when investigated, these were found to be fakes as well. where are all the actual winners who used the system? We investigated and cannot find a single winner who used this Lotto Master Formula System, yet you find many reviews that claim the system works. Sadly these lotto master formula reviews are again all false, as they are all written by the seller of the system and the affiliates who sell the system trying to earn commission. In reality, the formula that is sold to you under the name Lotto Master Formula and is just an lotto e-book filled with strategies right off the Internet that has been around for years and has been proven useless! All the the top legit lottery system review sites, report this lotto master system as a very poor useless system simply full of false advertising and highly recommends you to avoid it. Forget about fake testimonials and fake reviews, here is genuine poll results that real users voted on the best lotto system that worked for them. as you can see the Lotto Guy Lottery System won with 67% of the votes and the Smart Play Lotto Wheels system was second with 22% of the votes. These are the systems that people are actually winning the lottery using. 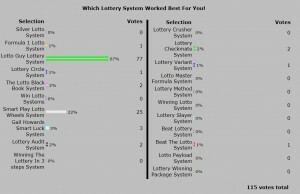 So where did the Lotto Master formula System rank in the lottery system poll? It looks to me that the Lotto Master Formula received 0% of the votes. Must be a great system to not even get any votes at all, what a crappy useless system it really is, just move on to better real systems and you will have much better winning success! The sad fact is most lottery systems are fake and will do nothing to increase your odds to win, do not ever buy a high cost system, or a system that has affiliates selling it, it is a sure sign of a con job. Still, you need a good lotto system, it is the best tool to give you more success to really win the lottery. These lottery sites can help you win the lottery easier! This entry was posted in Lottery and tagged lottery master formula, lotto master formula, lotto master formula book, lotto master formula free, lotto master formula pdf, lotto master formula review, lotto master formula reviews, lotto master formula system, lotto master formula website by Lotto. Bookmark the permalink. Thank you for confirming this lotto master formula system. I had a feeling it was total B.S and you just confirmed it, great write up. I see the lotto guy system is worth looking into, will do that! Seriously good lottery infomation, I would have never known about the lotto master formula and how silly the system actually is.